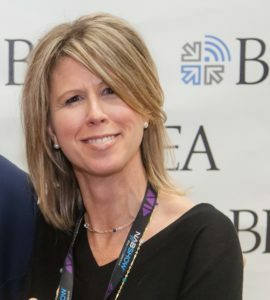 Heather Birks has been BEA’s executive director since June 2006. She builds strategic alliances with corporate and academic organizations, and works with the Board to revitalize the association’s annual convention, marketing and membership benefit efforts. Heather created a new format for BEA’s annual convention to include a showcase of creative work produced by faculty and students, an increased number of research presentations, and focused workshops on production, documentary, scriptwriting, assessment and research. Under her leadership BEA has increased the number of scholarships and grants awarded and launched programs like the Radio Show Student Scholar Program and BEA’s fall regional conference – BEA On-Location. Heather came to BEA after working for over 10 years at NAB – the Government Relations Department, the Television Department and finally to NAB’s Education Foundation where she helped build and produce the Service to America Awards and helped launch and manage the Broadcast Leadership Training Program, a 10-month executive MBA-style program for broadcasters interested in learning the art of assessing, acquiring and running successful radio and television stations.